Newsweek has launched a web-based RSS reader, i.e. My Newsweek — looks like a reasonably smart move on the face of it. But using the reader requires Joe Newsweek to grok terms like “feed,” “content,” and, “RSS” — which looks less smart. The real problem with Newsweek’s RSS reader (a private-label version of Newsgator) is that it’s not easy to find content to add without being a proficient RSS user (i.e. a GEEK). A feed is essentially a piece of content that you can subscribe to. Perhaps you have seen the little orange RSS buttons on your favorite web sites? 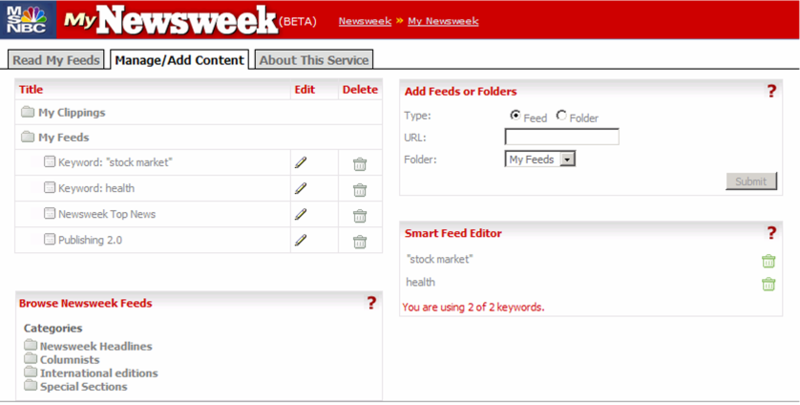 Those are links to feeds, and you can subscribe to feeds using services like My Newsweek. What kind of feeds can I add? You can add feeds created with any version of RSS (0.9x, 1.0, 2.0), and Atom 0.3 and later feeds. There are a few ways to add more feeds to your “My Newsweek.” First, you can select one from the “Add Newsweek Content” feature below your list of subscribed feeds. You can also add other feeds not found in the “Add Content” list by pasting the feed’s URL in the “Add Feeds or Folders” box. To find a feed’s URL, go to the source (e.g., CNN.com or a blog’s Web page) and look for that source’s RSS links. Advanced users: you can import your list of feeds with our OPML importer, found in the lower right-hand corner of the Add/Manage Feeds page. First of all, the term “content” is very media company-centric. Most people don’t think of themselves as consumers of “content.” They read magazines, watch TV, surf the web, and listen to music. Next, how many Newsweek readers do you think know the difference between the many versions of RSS ? Maybe 3? I still haven’t bothered to understand the difference, and I actually publish a feed. One question I have after looking at the example account is wether readers are able to import and export their subscriptions by OPML. I don’t see that they are, and the way that Newsgator supports OPML is one of it’s best traits. Gotta have that. What percentage of Newsweek readers do you think know what OPML is? Maybe 0.0001%? Here’s what’s really “gotta have” — an easy way for AVERAGE PEOPLE (there I go again) to find what they want. As already mentioned, adding Newsweek feeds is easy (point and click), while adding feeds via URL is hard (hunt and gather). The third option for adding feeds is the ill-named “Smart Feed Editor,” which is neither smart nor an editor. It apparently allows you to set up 2 (and ONLY 2) keyword-based feeds — I set up one for “health” and one for “stock market” (as suggested in the Ajax-powered help pop-up). When I check out the feeds, they were both blank. Now this maybe a beta glitch, but if I were Newsweek, I’d be pretty unhappy with Newsgator. Of course Newsgator’s own reader allows you to browse feeds by topic, which yields reasonably good results for the average person. But on Newsweek’s private-label version, you can only browse Newsweek’s feed. I guess Newsweek didn’t want their readers to have THAT much choice. Oh, how 1.0. Or maybe Newsgator doesn’t allow the broad-based browsing feature in their private-label service — just as bad. The lesson for Newsweek and other Old Media brands — beware geeks bearing gifts.